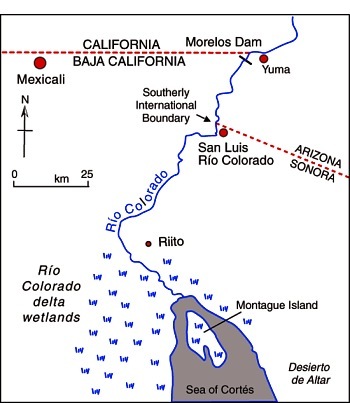 On Thursday, 27 March 2014, Mexican and U.S. officials were on hand to witness a release of water from the Morelos Dam (located on the border, see map) that should help to rejuvenate wildlife in the Colorado River delta. The delta area has been dry for many years. The agreement between Mexico and the USA allows for a “pulse flow” of water to be released down the Colorado River, which will bring water to the river’s delta in the Sea of Cortés (Gulf of Mexico) for the first time in more than five decades. The pulse is designed to mimic the effects of a springtime snow melt. The pulse flow will amount to a total of 130 million cubic meters of water over a period of eight weeks. The release of water is part of a pilot project, due to last five years, that will lay the groundwork for possible future agreements to ensure that the delta area receives sufficient water in the future to enable its fauna and flora to survive. You can help restore water to the Colorado River Basin by joining (free) Change the Course, a project of National Geographic and partners.